Soon after the publication of The Infinite Way in 1947, Joel Goldsmith gave a series of lectures in San Francisco. These classes set the foundation for what was to become Goldsmith's worldwide teaching ministry. They laid out a framework of spiritual principles with such integrity and purity that students of sufficient intent and motivation who worked with them could experience illumination. These lectures were recorded on a wire recorder and transcribed for students. Later they were put into a book called Metaphysical Notes, which has now become Consciousness in Transition. The book effectively allows the reader to sit in on Joel's early class work, which covered the practice of meditation, healing and treatment, prayer, the nature of God, and the nature of error. It introduces the reader to the path of spiritual growth necessary for ultimately attaining conscious union with God. 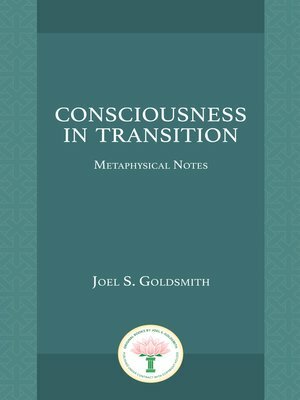 In Consciousness in Transition, Goldsmith gives the reader specific instruction on living, moving, and having one's being in spiritual consciousness and teaches universal principles that have been passed down through the ages by saints and sages of all spiritual traditions. Consciousness in Transition is the second book in the trilogy that includes Rising in Consciousness and Consciousness Transformed. Rising in Consciousness and Consciousness in Transition illuminate Joel's early class work. Consciousness Transformed comprises a lecture series given during the last years of his work. Together the trilogy presents a holistic overview of a living message.